Day 4 ended up being fairly uneventful for me. It started out well enough with more half decent roads out of the national park but lots of busy urban roads followed during the difficult to traverse west to east section through the E15 and the lower point of the Vercors National park. 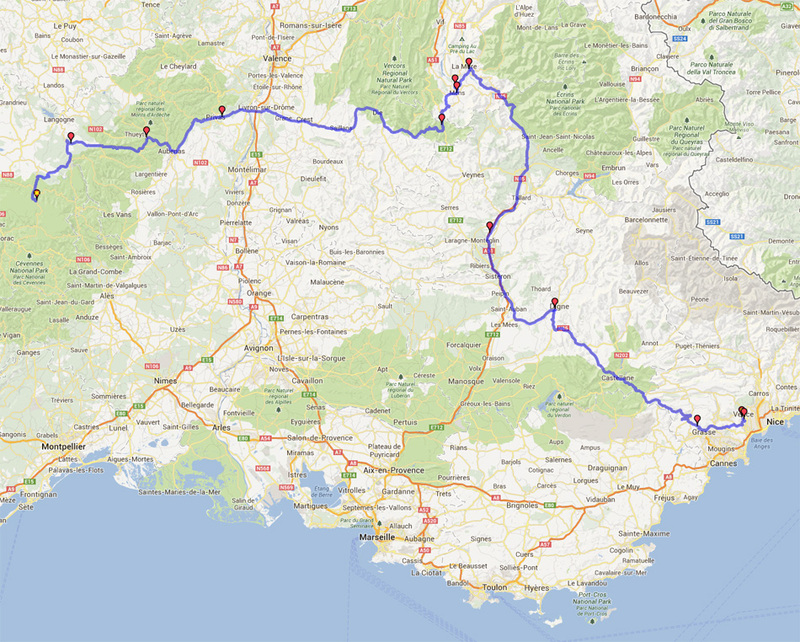 Once we hit the days highlight, the route Napolean just south of Grenoble, we sadly hit even more traffic. Caravans, bikes and lots of slow people in general. The beginning section of route Napolean was a decent enough road with some wonderful scenery but it was just too frustrating trying to make any decent headway. By the time we hit Sisteron time was running late and I was pretty tired too. A couple of us elected to take the E712 to Marseilles and then head straight for Nice on the motorway. As is turned out not only did we not get to the hotel for that night any earlier than the others but also, just past Digne, the route Napolean opened up a bit and apparently overtaking was a synch and the rest of the guys had a pretty good drive on it. That said, the consensus seemed to be that the last section was good but no better than many other roads we've been on on any other tour and certainly not amongst the best. My message therefore would be that the route Napolean is not really all its cracked up to be and you can do far far better elsewhere. 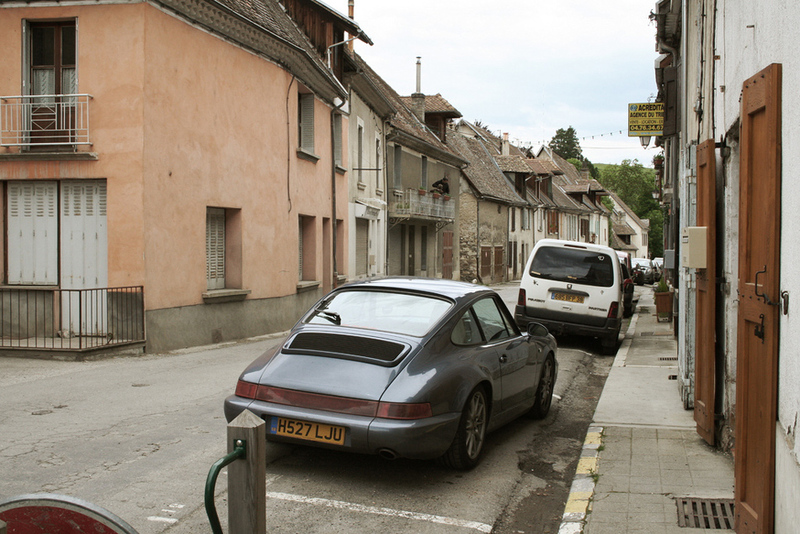 If you have to drive it then avoid the northern section at all costs and get involved beyond the commune of Digne Les Bains but when all is said and done, there is no substitute for emptiness and freedom from other cars. Stopping for some lunch at Mens just before joining the Route Napolean, just south of Grenoble. We were hounded by some stag party here, lots of drunk French blokes spoiling for trouble. 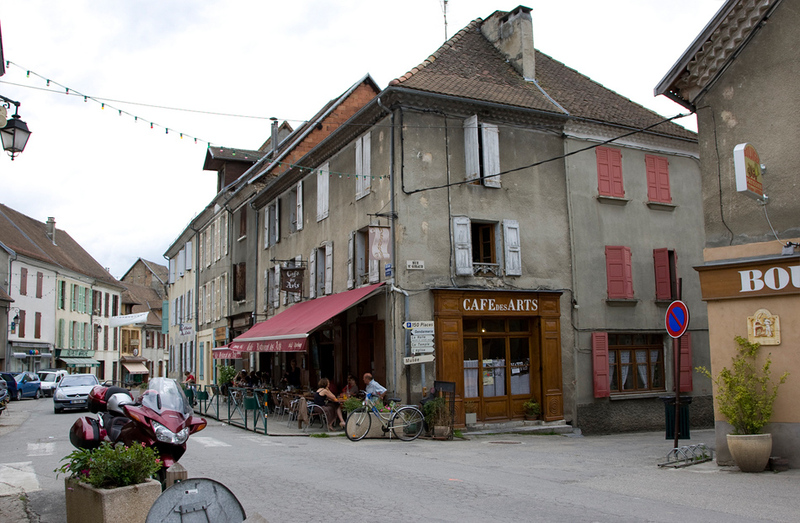 We calmed them down a bit though and they ended up being quite helpful and recommending us the Cafe des Arts. Somewhere near Tailard the Route Napolean has some very fast flat sections. The bikers around there seemed good about warning us of speed traps and cameras. Two ducks got separated from the main pack though and gave chase to catch up. The French police were really great though and let the guys off massively, acknowledging what good cars and strong brakes we all had ! 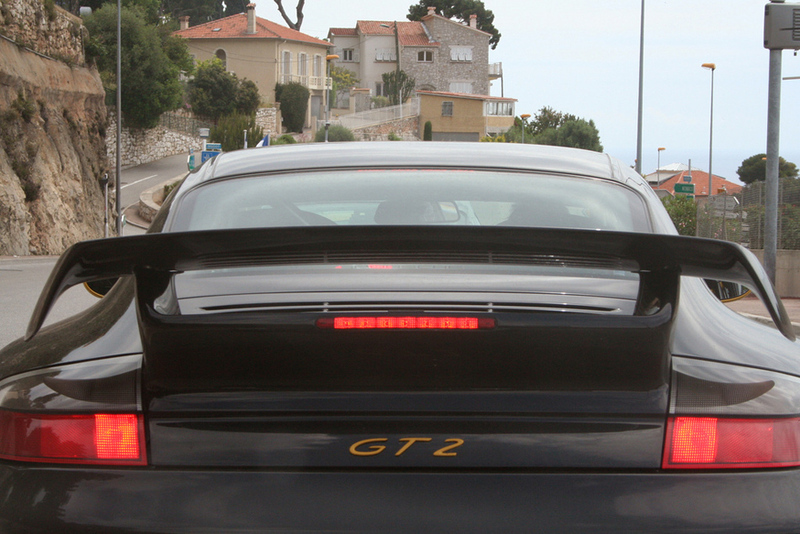 Heading into Nice with a strong comforting sense of belonging. It felt like going home to me as i've spent so much time there since I was literally a baby. If Day 4 had been the most disappointing so far in respect of the driving, then the evening did go some way in making amends. 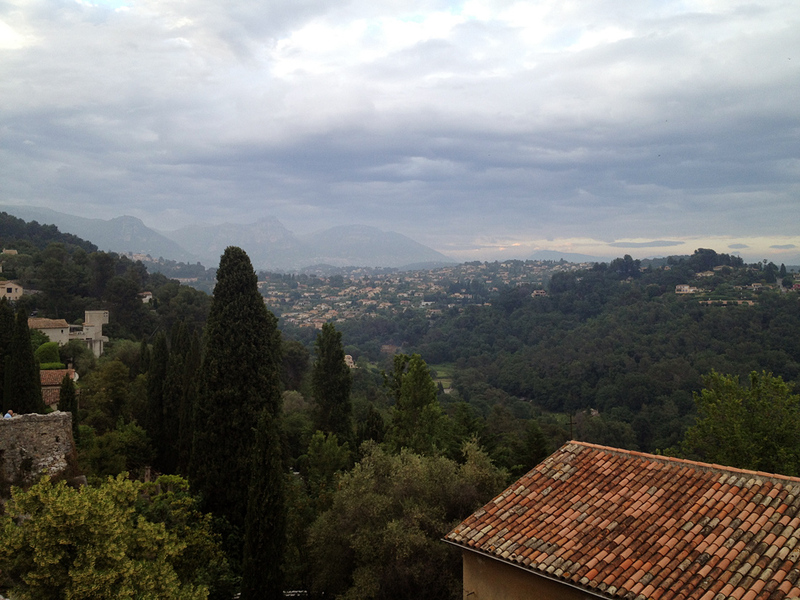 The hotel at St. Paul de Vence, La Vague, was a newly opened establishment and fabulously modern throughout. I think I was actually the first person to use my room and the bar and dining areas were also in pristine unused condition. La Vague was also the cheapest hotel in St. Paul that I could book but I suspect that the prices are introductory at the moment to give it a marketing boost so get in there quick if you are planning on visiting. The staff were extremely friendly and the breakfast outstanding, notable for having both 3 minute and 5 minute boiled eggs on offer and cooked to perfection as well. The town of St. Paul is a very old and beautiful walled medieval town, former home to many well known actors, artists and celebrities with stunning views of the French Riviera and some of the prettiest cobbled streets you have ever laid eyes on. The last time I was here was 20 years or so ago when I stayed at the house of the german actor Curd Jurgens (the villain Karl Stromberg in "The Spy Who Loved Me") whose daughter was a friend of mine. 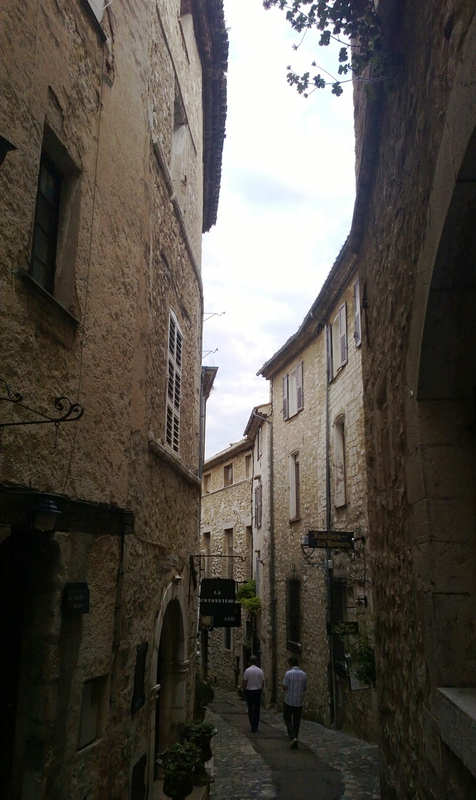 All those years ago I dined at the very famous La Columbe D'Or restaurant and hotel, run by the Roux family and situated at the entrance to St. Paul. This time round it seemed only right to visit again. The food at La Columbe D'Or does not in any way match the prices or the name that this place carries so be warned. 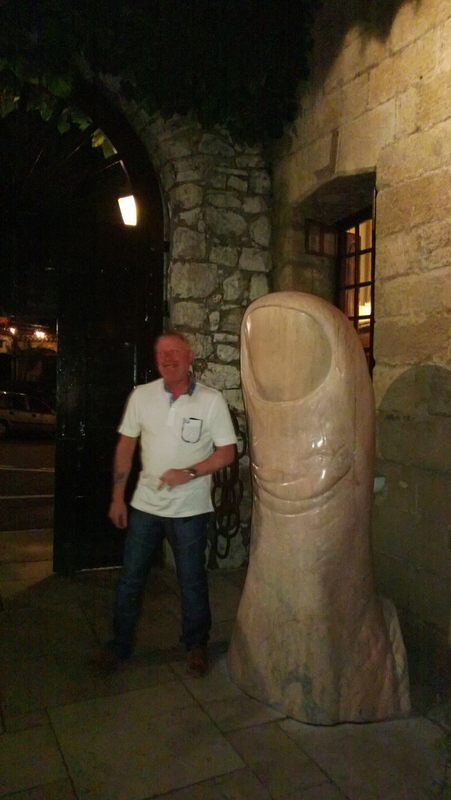 No, it is a place to be enjoyed for its atmosphere, setting, wonderful outdoor terrace and of course its art. 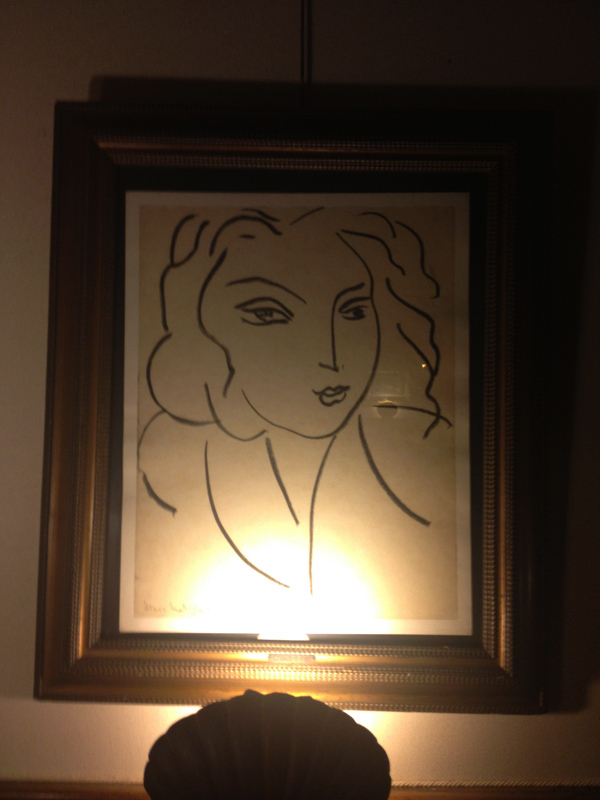 You will see Miros, Picassos, Matisses, Leger's, work by Chagal, Modigliani and Calder casually adorning the walls, corridors and outdoor areas. If you want to read the extraordinary list of famous people who have frequented this place over the decades then have a quick google as well, you couldn't make it sound more impressive if you made it up. Unfortunately on the back of day 4, day 5 was always destined to be pretty uneventful driving wise. 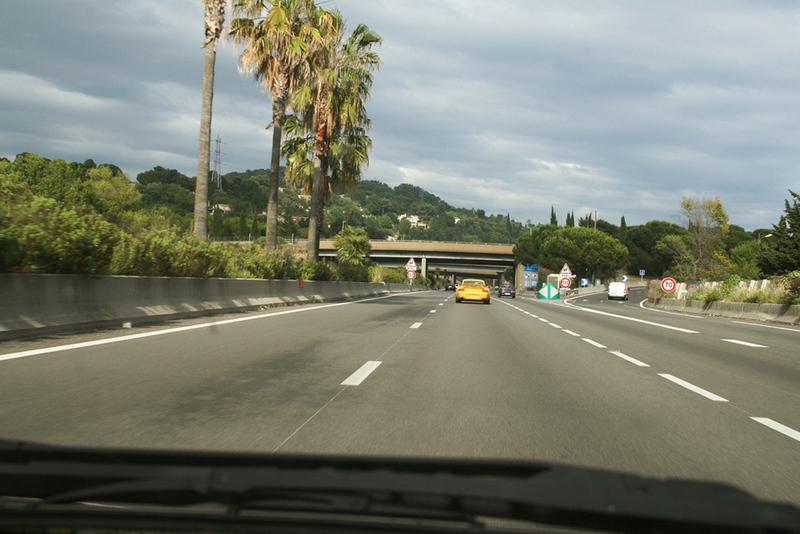 Faced with a straight run to Florence taking in as much of the coast as possible we decided to cut our losses, reduce the driving time a little and take as much motorway as possible instead. It wasn't without a few high points though. 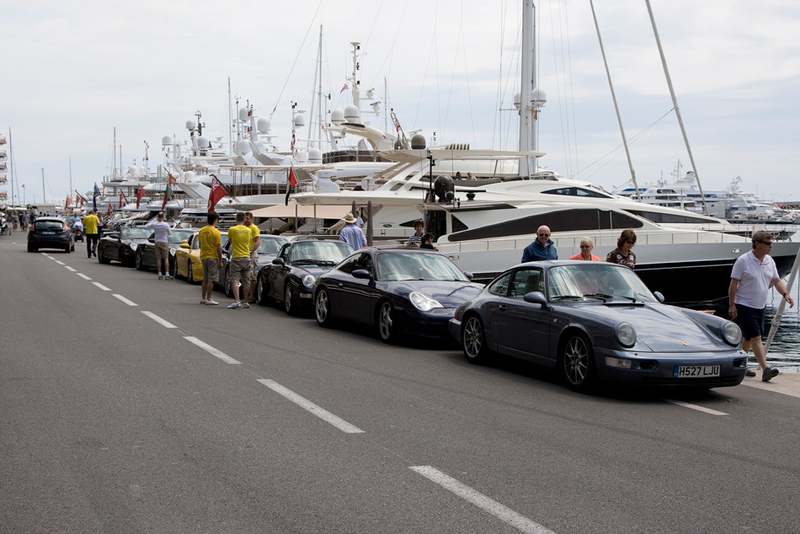 The first of these was 3 laps of the Monaco GP circuit. We got a lot of attention here and gave the crowds something extra to look at. It was fascinating to drive the circuit as the grid markings and many of the stands were still in place only 2 weeks after the actual 2013 race. The tiny length of the course as well as the narrowness of it all really is an eye opener. 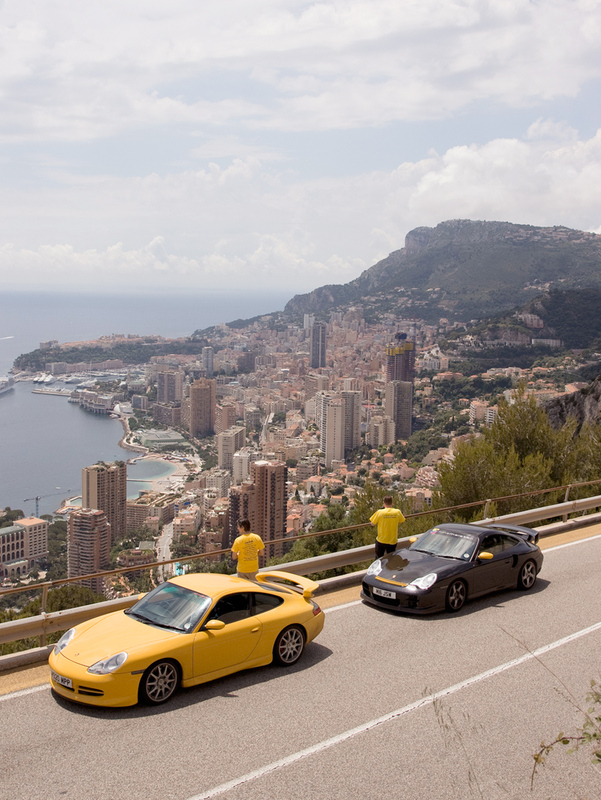 Monaco seemed as glamorous and as alluring as I always remembered it. The views from the hills on the eastern exit roads were absolutely stunning. The GT's of Jackal and Wiz here get a good look before heading east. 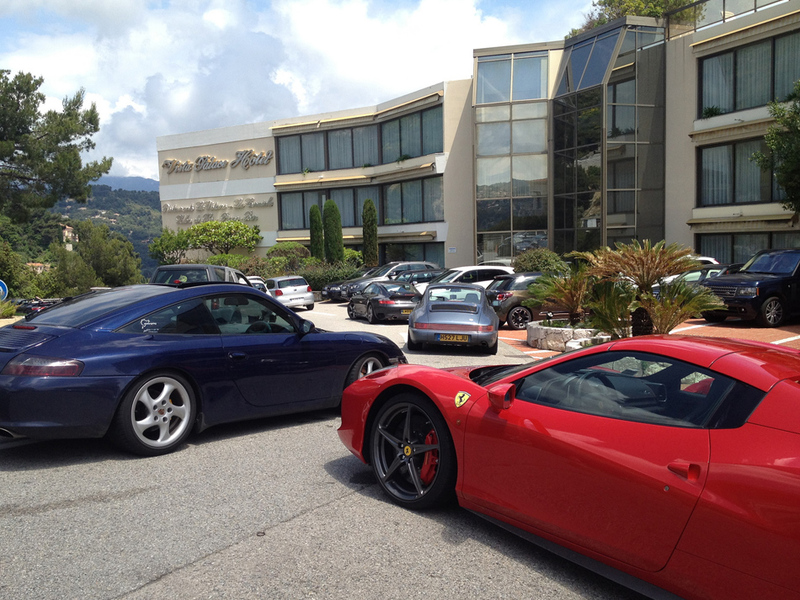 As we left Monaco and made some serious speed on the motorway into Italy, we had an encounter with a lovely 991S. This beast was owned by a really nice Russian chap and his girlfriend who were holidaying down to the Italian lakes. He played along with us for many many miles, riding in tandem and showing us what his 991 could do ... a mighty quick car by any standards and very impressive for what is just a regular non blown, non GT 911. As we hit the airport road to Florence the traffic became really poor. At one point we had to come off the motorway just to get round a complete blockage that was at a standstill for at least the length of a whole junction. The weather was poor here too and the dullness and tiresome progress made was alleviated only occassionlly like when we went past this appreciative Italian chap in his beautiful silver 911T. As per the emerging pattern of '911uk Italy 2013', any poor driving days always seemed to be very handsomely rewarded by that day's eventual destination. 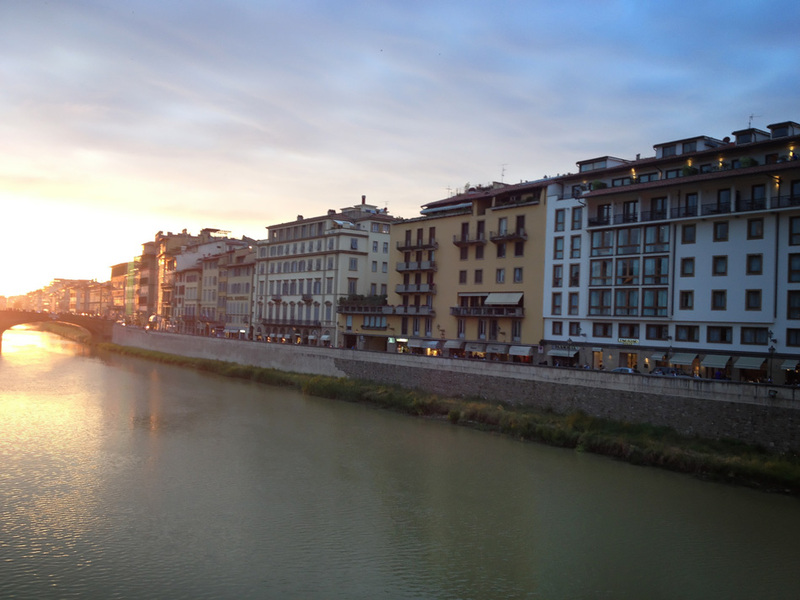 All was forgiven once stepping onto the hotel Belverdere's balcony at Florence and within another hour or so we were walking onto the Ponte Vecchio with a stunning sunset firing down the river. Florence was as amazing as ever. Nothing can prepare you for the sight of the Basilica di Santa Maria del Fiore, surely one of the most beautiful buildings in the world. The beers weren't bad either ! Day 6, was always intended as a quick sub 200 miles run to Jesolo and the plan was to spend the whole afternoon and evening in Venice. 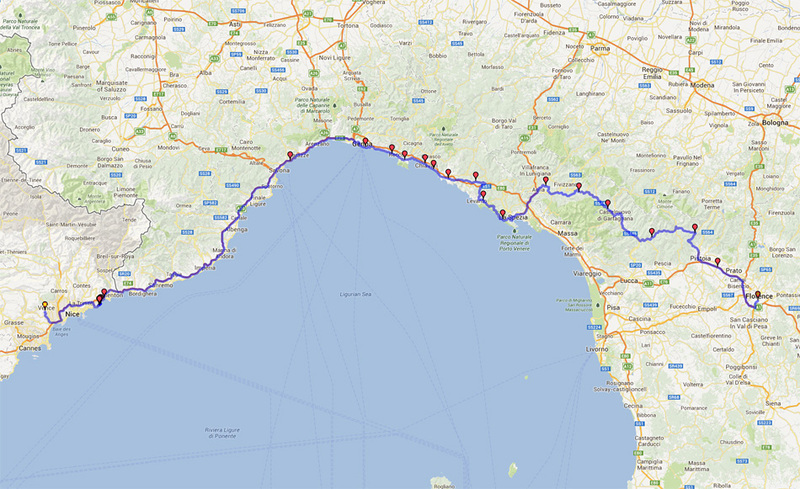 The thing is this is Italy you are talking about and any trip should factor that in. The direct roads can be poor, congested and fraught with problems. A very simple journey ended up taking us many many hours and we eventually got to the hotel well after 6pm. This was supposed to be our one guaranteed day of driving respite but like all the days on this trip, the driving turned out to be much longer and time consuming than planned or anticipated. 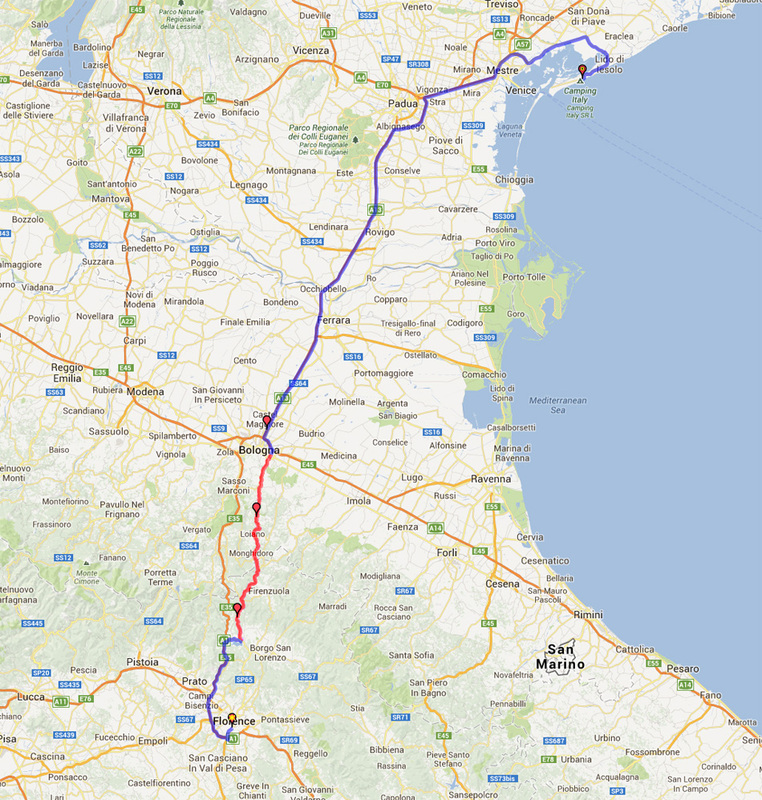 The route here was direct motorway stuff apart from the wonderful SP65 that runs parallel to the Motorway up to Bologna (marked in red). 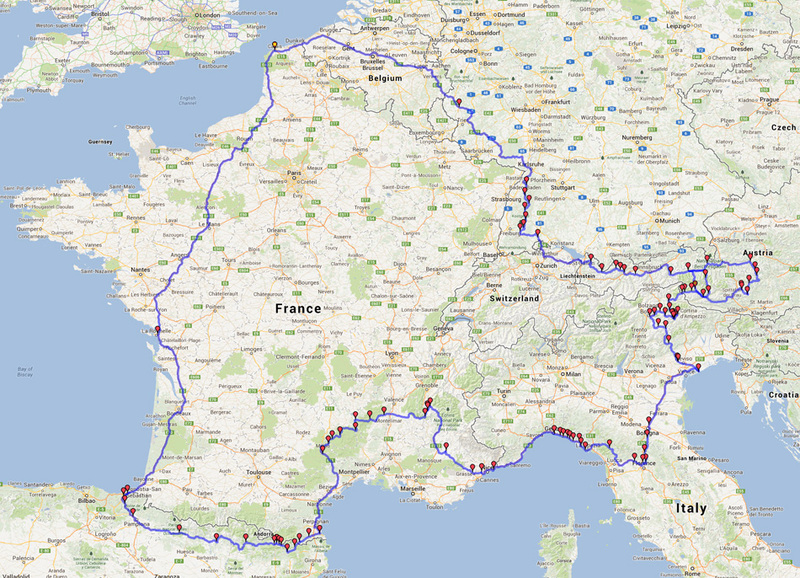 This is a very long twisty route which comes highly recommended and is fantastic for the slower aircooled cars. 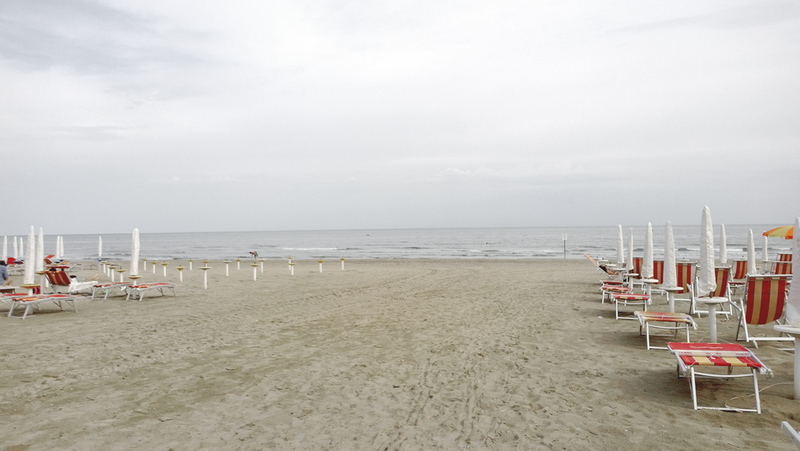 We arrived at the hotel Righetto in Lido de Jesolo just in time for a quick swim. Within 10 minutes of parking we all had the shorts on and ran into the adriatic after an afternoon's worth of hot bothersome commuter driving. After a quick dip the hotel ordered us a car taxi and water taxi from the end of the Jesolo penninsula into Venice. So one minute there we were strolling up the beach from the seas and then the next instant we were all in an 8 man taxi van. A short 5 minute drive to Punta Sabbioni and then we were quickly ushered into a private boat. I'd barely sat down and suddenly this thing rears its nose up and lists very steeply to the left as someone shouts "I think this is the 911 of water taxis !". That pretty much set the tone because within seconds the young reckless Italian driver had the thing up to 40 knots or so and was caning it over the rough wake and carving the thing left and right like some sort of thrill ride. "Where are you from" he asked and when I said "London" he flicked the steering wheel sharply left then right then left again, and gave the motor another slug of extra throttle. So there we were were, eight guys grinning their faces off, holding on for dear life, speeding towards St. Marks Square; probably the single most memorable moment of the trip. I'd never been to Venice before and I could feel the excitment and anticipation rapidly rising in me. By the time we were actually coasting toward St. Mark's square it was almost like I was trembling inside. Nothing can prepare you for Venice. There is no other place I know of that will foretell or let you glimpse into the experience of this place. If you haven't been then you simply have to at some point, preferably sooner rather than later. You need money though, lots of it. 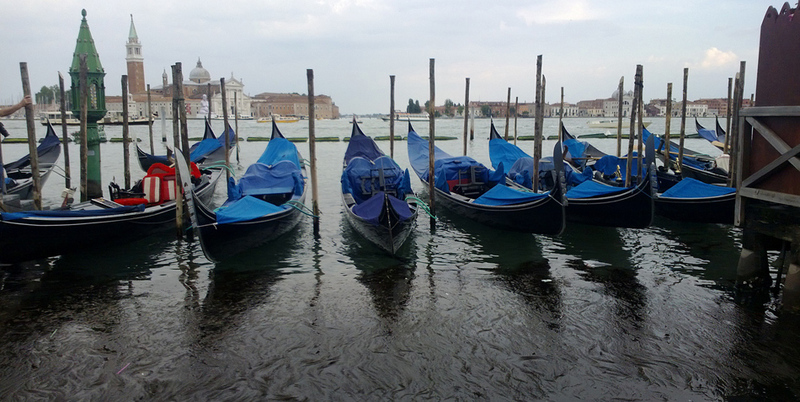 Everything seemed to be 150 Euros whether it was a Gondola, a Water Taxi or a decent evening meal for one person. 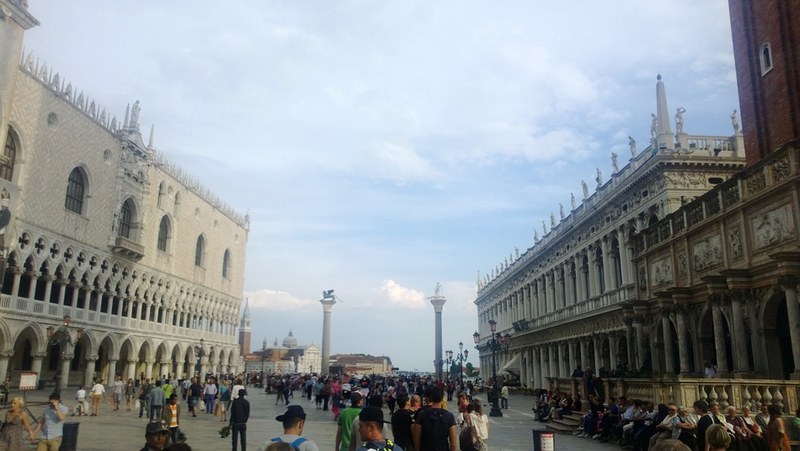 After a stroll round we went back to St. Mark's Square to catch the ferry of the five star hotel Cipriani which took us to our evening meal. 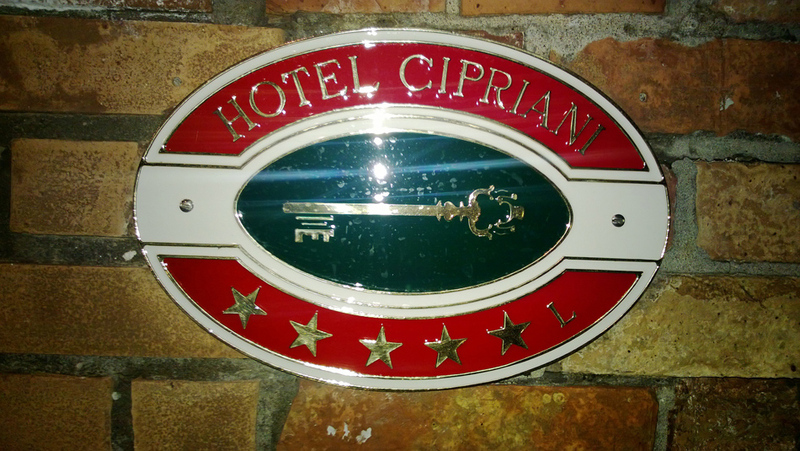 The Cipriani is a top draw place and has a big tie in with the Orient Express trip I believe as well. We ate in the "casual" restaurant but it still cost us a small fortune each even with just a limited servcing of wine. I'm guessing the smarter restaurant must be 200 or 300 Euros a head. 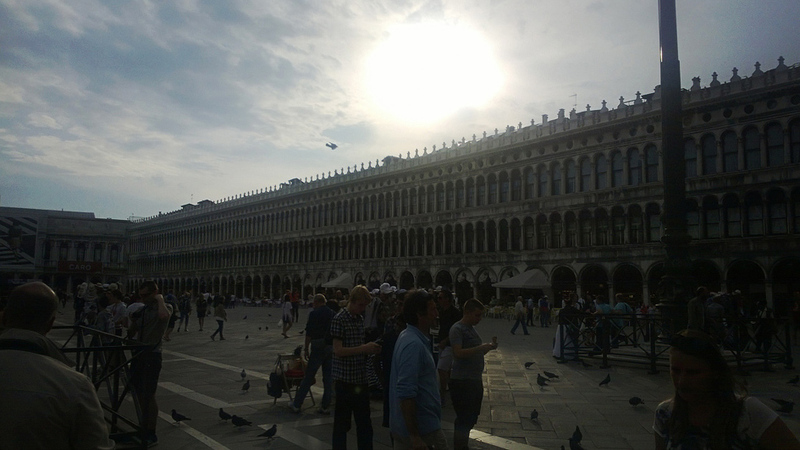 The food I had was the best all holiday and the view overlooking St. Marks Square was truly memorable. When we took the ferry back to the main island we opted to seek out a bit of value and found a very nice specialist beer cafe so it was Chimay's all round before heading for the water taxi home.